When I saw the mixed berry crostata on LAtimes.com the other day, I started getting ideas. I had just bought some blackberries and peaches at the farmers’ market, and those two things are in season at the same time for good reason. I couldn’t wait to put them together in a simple, rustic kind of tart. The crostata dough from the LA Times is adapted from one by Nancy Silverton of Mozza. It’s a fairly straightforward pastry, but it includes a tablespoon of vanilla extract. I was sold. I’ve added nuts or lemon zest to dough before, but I had never thought of adding vanilla to pastry. 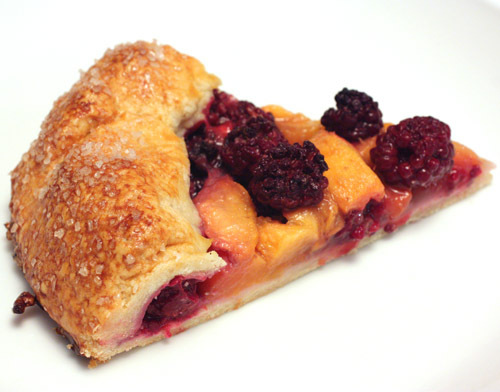 With fresh, ripe, juicy peaches and just picked blackberries, a nice crust to contain them is all you really need. I did go to the trouble of peeling the peaches this time although I often leave skins intact. It’s a simple procedure of bringing a pot of water to a boil, placing the peaches in the boiling water for about 45 seconds, and then transferring the peaches to ice water. Then, the skins slip right off when pulled with a paring knife. 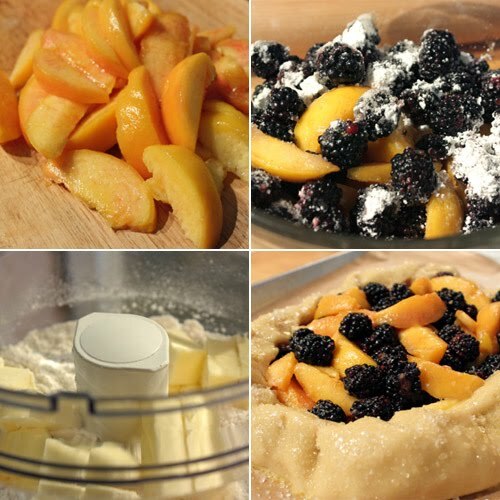 The peeled and sliced peaches and washed and dried blackberries were mixed with a little sugar and some cornstarch, and the filling was ready. The crostata dough was made in a food processor with all-purpose flour, cake flour, sugar, and salt, and chopped, cold butter was pulsed into that mixture. It was actually pulsed to a finer state than I usually mix a pastry dough. It was suggested to process until it resembled moist cornmeal. Ice water and vanilla extract were added, and then the dough was wrapped in plastic and chilled for a bit. For rolling out the dough, it was recommended that it be left kind of thick which is a good idea when juicy, fresh fruit is involved. The edges were rolled in over the fruit, and I brushed on an egg wash and sprinkled coarse sugar on the dough. The crostata baked for about 40 to 45 minutes until the fruit juices were bubbly and the crust was golden. 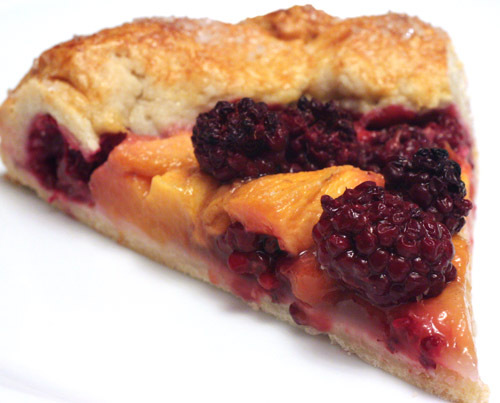 Sure, some ice cream or whipped cream wouldn’t be out of place here at all, but I was so excited about my first use of blackberries and peaches this season that I enjoyed the crostata with no added embellishment. This wasn’t a flaky, layered kind of pastry crust, but it was golden and crisp on top and tender in the center. With the flavor of vanilla throughout, it was a fine vehicle for the mixed fruit and thickened juices. If you have some ripe berries or other seasonal fruit on hand, consider using it in a crostata with this pastry dough, or try adding vanilla to your usual dough recipe for lovely added flavor. I started to tell you about the book Ad Hoc at Home the other day. Since this is a book about family meals, it’s organized according to how planning meals at home supposedly happens. The chapters for main courses of meat and fish come first assuming those are chosen first, and they're followed by soups, salads, vegetables and side dishes, breads, and desserts which are picked to go with a main course. That makes sense. Although, I have been known to plan meals around a vegetable or salad I have in mind. This particular meal did involve barbecued chicken, but my real plan was to put together a menu that would include fresh, local corn. The creamed corn recipe in the book had stuck in my head, and I had to have it. Creamed corn may not ordinarily require a recipe, but in this case, it led me to adding cayenne and lime zest, and so I was happy to follow it. Then, the asparagus coins caught my eye. Rather than leaving the asparagus in spears, they were cut into nice, little rounds and cooked with chive oil and parsley water. Yes, it was just a tad fussy for a simple, home-cooked side dish, but the flavor was fantastic. 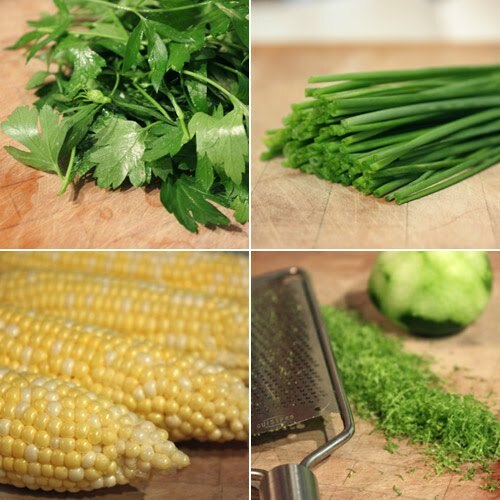 First, for creamed corn, Keller offers a handy tip for removing silks from the cut kernels. Move your hand through the kernels, round and round, and the silks will stick to your hand. Rinse your hand and repeat as needed. With kernels free of all silks, the corn was cooked in a large saute pan with melted butter, lime juice, and salt over low heat. Once the liquid evaporated, cream, cayenne, and lime zest were added. 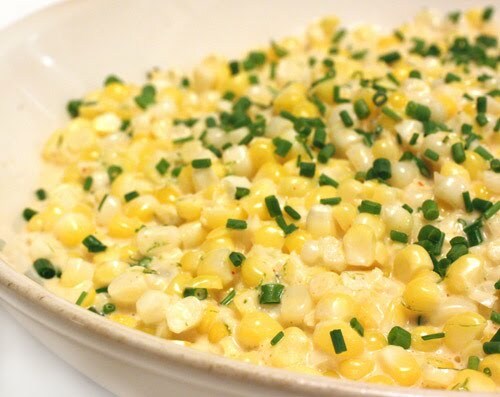 When the corn had absorbed most of the cream, chopped chives were added, and it was done. To make the asparagus dish, chive oil and parsley water needed to be made in advance. To make chive oil, chopped chives were placed in a sieve under hot running tap water to remove any chlorophyll taste. The chives were drained and dried and pureed with canola oil. That mixture was refrigerated for 24 hours and then poured through cheesecloth to become perfectly smooth. Parsley water was made with leaves and tender stems that were wilted in a pan with a teaspoon of oil and a little honey. That mixture was then transferred to a bowl with ice cold water to stop the cooking. All of that was then pureed and strained. 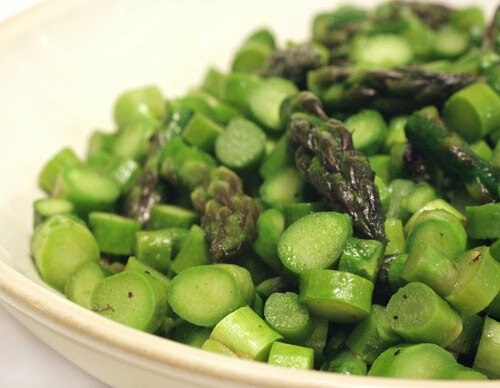 The reason for the parsley water is that it helps in retaining the flavor of asparagus. The chemical in asparagus that gives it its taste is water-soluble, so cooking in plain water causes some of that flavor to disappear. With those items prepped, it was time to address the asparagus. It was suggested that the spears be cut on a mandoline for perfectly equal-sized coins. I opted to quickly chop with a knife and accepted that mine were close enough to being equal in size. So, the almost perfect asparagus coins and tips were placed in a saute pan with chive oil and salt. As soon as the edges of the coins began to cook, parsley water was added, and it was left for a brief couple of minutes until just tender. I said the parsley water and chive oil were fussy, but they really weren’t difficult to prepare. In fact, I finished them both in about 20 minutes and that included washing dishes. I would need to do a side by side comparison with asparagus cooked in plain water to know if the parsley water were truly effective in preserving asparagus flavor. But, I can say that the taste was excellent and very much of asparagus with a mild side note of chives. And, the creamed corn was ridiculously good. Fresh corn and cream can do no wrong, but add a little lime and cayenne, and it becomes even better. These were simple, home-cooked side dishes that were taken to another level, and that’s the point of Ad Hoc at Home . The kind of food that we eat at home with our families is what Ad Hoc at Home is all about. The book is dedicated to comfort food from American family traditions and other cultures as well, and it serves as a reminder to sit down and enjoy time spent around the dinner table. That being said, the book is also about cooking with a certain level of precision and paying close attention to technique for the best possible results. This is a Thomas Keller book after all. His secret equation is great product plus great execution equals great cooking, and he provides the tips to achieve it. The recipes here are far simpler than what you’ll find in the French Laundry Cookbook , but there’s still a lot of care taken and some intentional fussiness here and there. I was immediately inspired to put together the kind of family meal that this book encourages. 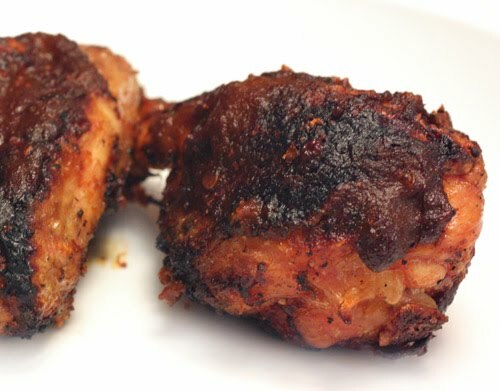 On page two, Keller describes a meal he prepared for his father which included barbecued chicken. Believe it or not, in the recipe it states, “try to find a sauce with some integrity, preferably from a small producer.” Yes, that was a suggestion to use a purchased barbecue sauce. I couldn’t do it. For a Thomas Keller meal, I had to make my own sauce. 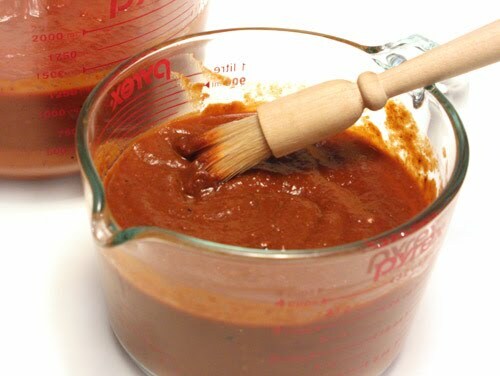 I’ll describe the side dishes, which were from the book, in another post, but what I’m showing today is the sauce I made for the grilled chicken. I had saved this recipe from the June 2009 issue of Living magazine. 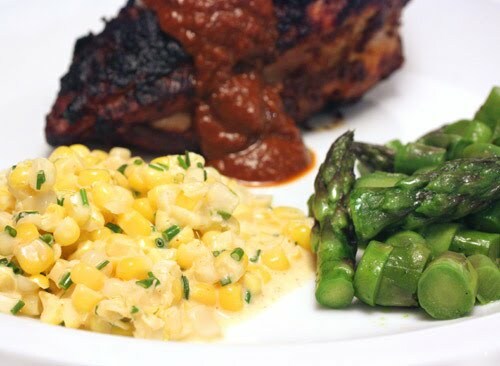 In that issue, there was a classic barbeque sauce recipe followed by three variations. I chose to use the smoky chile and coffee option. I hope Keller would approve. To start, the classic sauce recipe was prepared which involved sauteing chopped onions and garlic. Salt, pepper, ancho chile powder, ground coriander, cumin, molasses, and brown sugar were added next. After that simmered for a bit, canned crushed tomatoes and cider vinegar were added, and that mixture was left to slowly simmer for about three hours. It’s a long simmer time, but it doesn’t require much attention other than an occasional stir. During the last half an hour, I placed chopped, seeded dried chiles in a bowl with hot espresso to rehydrate them. 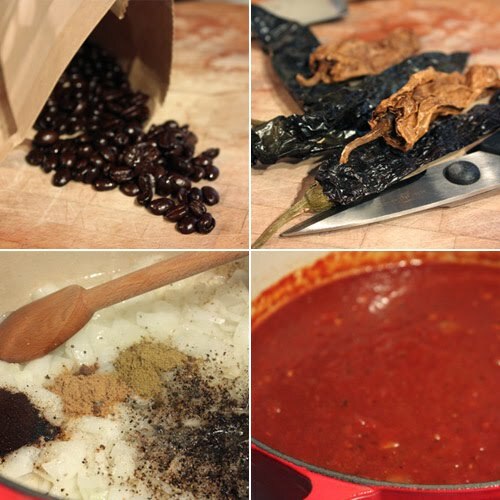 When the sauce was nicely thickened, half of it was pureed with the chiles and espresso. I left the other half as it was and placed it in the freezer. That way, I can try one of the other variations at a later date, and peach and bourbon, I’m looking at you. As Keller advised in the book, I bought a whole chicken and cut it into pieces and that seems to get easier every time I do it. The chicken was seasoned and left in the refrigerator for a few hours. Then, the legs and thighs were placed on the grill first followed by the breasts and wings a few minutes later. When all of the pieces were cooked through, the sauce was added and it cooked another couple of minutes. We did a quick taste test of the classic sauce versus the smoky chile and coffee sauce. The classic was sweet and flavorful, and it was a perfectly good barbecue sauce. The smoky chile and coffee, however, had layers of earthy flavor that balanced the sweetness, and there was a little spicy heat for good measure. It was a thick, clinging kind of sauce which was great for chicken. The barbecued chicken and vegetable side dishes made up the kind of meal that makes you slow down for a bit. We enjoyed some simple but memorable food, and we’ll be doing more of that as I continue to use the book. I don’t know where or when these cookie bars originated. I do know that I started seeing them everywhere over the last year. 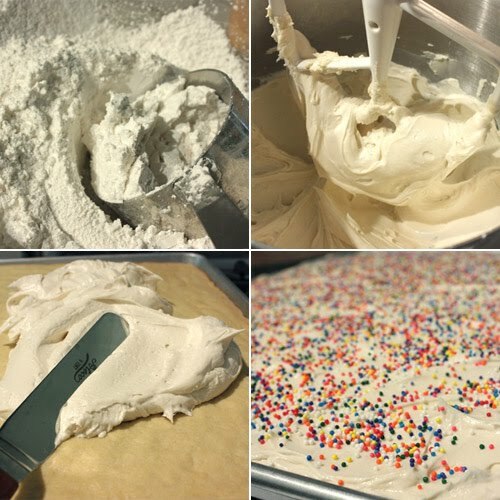 There are sugar cookies bars on My Baking Addiction, The Repressed Pastry Chef, Completely Delicious, and Love and Olive Oil and many more. The earliest post I’ve found is from Taste Buds. If you know the origin of them, let me know. I have a thing for sugar cookies. They are the best cookie ever, but they are also labor-intensive. 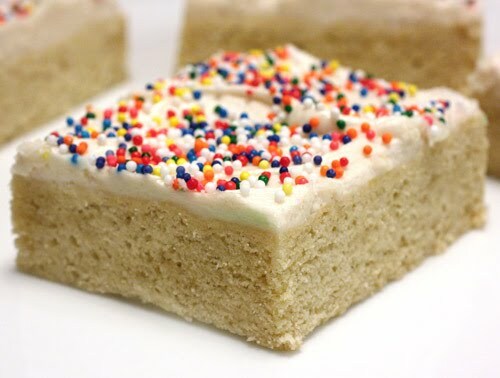 The allure of the sugar cookie bar is that the dough is baked in one sheet, it’s frosted all at once, and then the sheet is cut into pieces. This is a very streamlined process for a sugar cookie. When I reached my breaking point and mentioned that I simply had to try baking these myself, my sister demanded that I do so right away and bring them with me when I visited last weekend. My arm was twisted, I pulled the butter from the refrigerator, and got to work. The recipe for these is always the same. A cup of room temperature butter is creamed with two cups of granulated sugar. 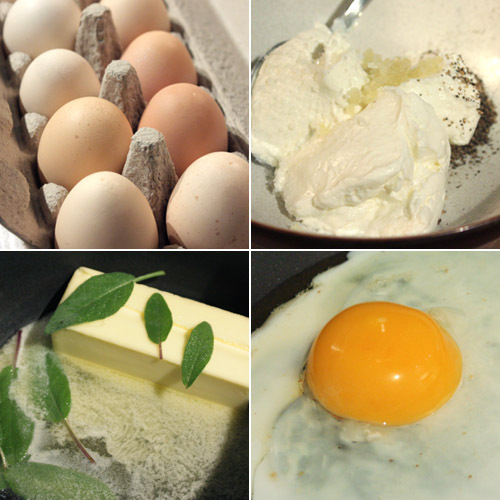 Four eggs are added, one at a time, mixing well after each addition. Two teaspoons of vanilla are added. Meanwhile, five cups of all-purpose flour are sifted with one teaspoon of salt and one half teaspoon of baking soda. The dry ingredients are slowly added to the butter mixture and are mixed until just combined. The oven should be pre-heated to 375 degrees F. The dough is spread onto a thirteen inch by eighteen inch sheet pan and patted out to the edges evenly. It’s baked for twenty to twenty-five minutes and then allowed to cool. For the frosting, some recipes suggest a mix of butter and shortening, but I used all butter. So, one cup of room temperature butter was mixed with one teaspoon of vanilla and a pinch of salt. Four cups of confectioners’ sugar are added slowly and mixed until combined. For liquid, you can add five tablespoons of milk, but I used a couple of tablespoons of milk and couple of pomegranate juice. I was hoping for a pale pink hue, but it really didn’t color the frosting much at all. After applying the frosting, I do think sprinkles are absolutely necessary here. Then, cut and serve. In my case, I cut, packed the bars into an airtight container, shoved that into my carry-on bag, and hoped the bars wouldn’t end up too smooshed after being transported. The frosting did get a little flattened by the time I reached my destination, but they weren't ruined. The texture of the cookies was just right. They weren’t too firm or too crumbly, and the frosting kept them from becoming dry. 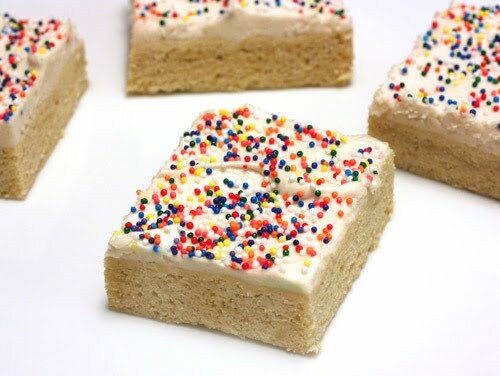 I still have my favorite sugar cookie of all time that can never be replaced, but these are very, very good cookie bars. I know I’ll be baking these again and again. And, who can resist sprinkles? You know how food tastes better when you’re on vacation? I’ve had a lingering memory of a vacation meal for years now. It wasn’t even anything special or planned in advance or exotic. It was a meal at a restaurant we picked because it was the first place we found and we were hungry. 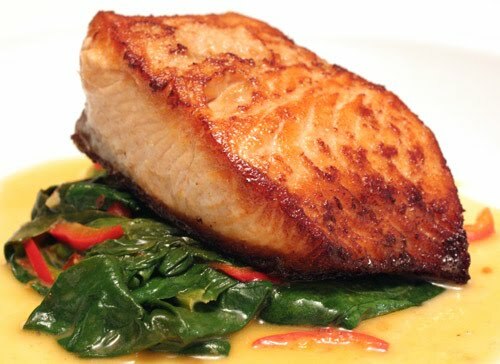 I ordered a simple salmon dish served with spinach, and it was flavored with ginger, soy sauce, and sesame oil. That combination of ingredients is so meant to be that I still think about that meal and have hoped to experience it again. It was light but satisfying. 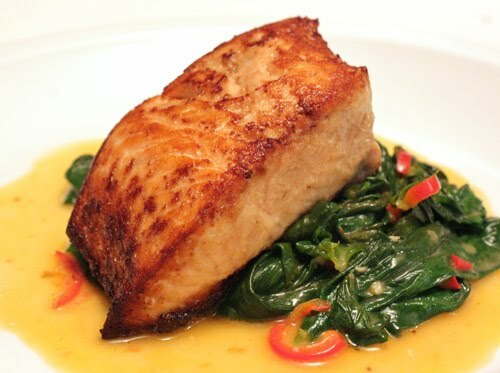 Anytime I see salmon with spinach and ginger on a menu, I think, that’s it, but of course it’s not so simple. The sauce can’t be heavy and the salmon can’t be dry and the soy sauce can’t overpower the other flavors. With all of that in mind, when I saw this salmon and coconut spinach dish in Donna Hay’s Off the Shelf , I had a feeling it would be great. This is close to the meal I remember, but the coconut milk and red chiles are an added touch. All the other flavors are there, and as a bonus, this is really quick to prepare. Wild salmon was marinated with grated ginger, sesame oil, and soy sauce, and then it was briefly seared on each side. Meanwhile, I cleaned some spinach I received from my CSA. Garlic, chopped red chiles, and chlli paste were cooked in a saucepan with a little oil. Coconut milk and lemon juice were added and simmered. Then, in went the spinach which cooked until it wilted. The end. Dinner was ready. This was possibly the fastest meal I’ve made in months. I accept that being on vacation, being away from home, being in a place for the sole purpose of having fun does indeed make food taste great, and that’s why I remember that meal so fondly. 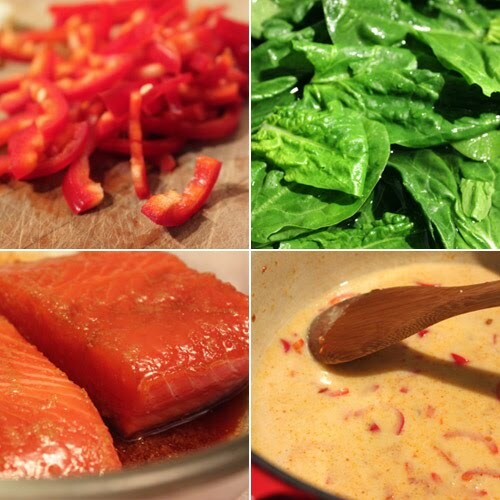 It’s also true that some ingredients just go together really well, and salmon, spinach, and ginger fit that description. This version with coconut milk and red chiles built on that theme. I enjoyed it as much as I thought I might, and I like that it wasn’t an exact re-creation. Instead, it became that great salmon and spinach meal I made at home that reminded me of that vacation. 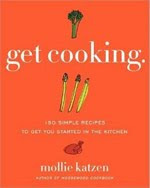 Mollie Katzen, What Are You Reading? 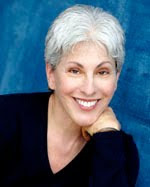 James Beard Cookbook Hall of Fame author, award-winning illustrator and designer, public speaker, and influential consultant and advisor are some ways to describe Mollie Katzen. She brought us the Moosewood Cookbook , The Enchanted Broccoli Forest , and Vegetable Heaven to name just a few of her books, and through her work, she has highlighted and popularized healthy and delicious vegetarian cooking. Her latest project is Get Cooking which is a very well-received series of books and videos for beginning cooks. Mollie explained that most of her reading time is spent with literature, but there was one food-related book she wanted to mention when I asked her what are you reading? There is one food book that I just got and am madly in love with! 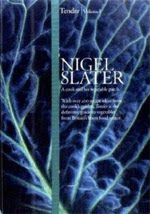 An esteemed colleague, the great Portland chef (and gardener) Greg Higgins recommended this to me: Nigel Slater's Tender: A Cook and His Vegetable Patch , and I bought it and found it enthralling. His love for vegetables and his recipe style are truly inspiring-like being born as a cook all over again. Thank you for participating, Mollie! I actually received that book as a gift recently and can’t wait to read it. Check back to see who answers the question next time and what other books are recommended. I had a disappointing bread experience a couple of weeks ago, and that’s not the bread I’m showing here today. That particular bread was the result of a time-consuming, all-day kind of baking project even though it wasn’t a sourdough bread. It required several folds and turns of the dough, and a nice, long proofing time. It did have a delicious, if tedious to prepare, filling of whole garlic cloves and balsamic syrup. Three heads worth of garlic were separated into cloves, boiled, and peeled, and then the garlic simmered in thick balsamic syrup. That syrup and the garlic were layered into the dough before the final folds. The bread smelled amazing as it baked. And, after all of that, it tasted, well, just alright. The crumb wasn’t what I’d hoped it would be, and while the flavor of the garlic was great, that of the bread itself wasn’t. That left me wanting to bake a really, really good loaf of bread, and that’s when I found this one on the Wild Yeast blog. Susan said this continues to be her favorite sourdough, and now I know why. There was of course some time involved in making it, but that was mostly fermenting or proofing, waiting, time. 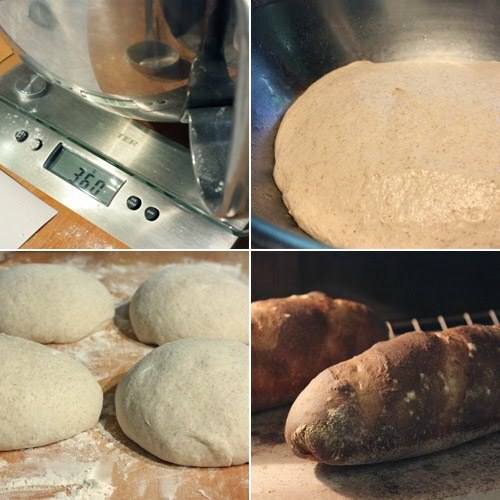 The active steps were actually very straightforward and quick compared to other sourdough bread recipes I’ve made. 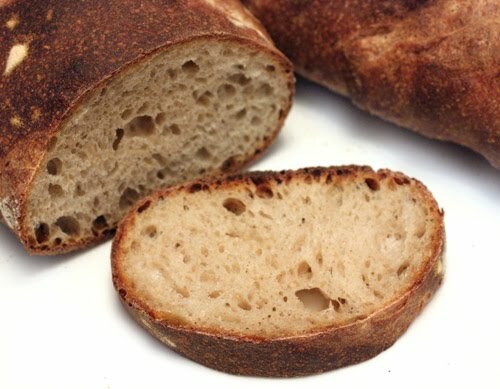 Outside, this bread was golden and crisp with a good, deep, crust taste, and inside, the crumb was flecked with color from rye flour, nicely chewy, and flavorful from the sourdough. Yes, this was a bread that was worth the wait. The dough was made with only white starter, no commercial yeast, and I used bread flour and rye flour. The flours, starter, and water were mixed and left to rest before salt was added and the dough was mixed again. Then, it was transferred to a wide, oiled bowl. A wide bowl is a good choice so that the dough can be folded without removing it. The dough fermented for two and a half hours and was folded at 50 and 100 minutes, and this was so easy. Leaving the dough in a wide bowl and just coming back to fold twice was a breeze. After the two and a half hours, the dough was divided into four parts which were shaped into balls and left to rest for 15 minutes. Batard loaves were formed from the balls, and they were covered with plastic. The loaves could have spent the night in the refrigerator, but I left them at room temperature for a couple of hours and then baked them. I baked the loaves on a stone and sprayed water to produce steam during the first twelve minutes of baking time. Then, for the last five minutes, they baked with the oven door propped open, and last, the oven was turned off while the loaves sat in it for five more minutes. I love the crackling sounds you hear when the loaves have just come out of the oven. They sat on a cooling rack and made their noises, and I waited not so patiently to have a taste. The crust was the deep, brown color that it was supposed to be, but I thought the surface was a little smooth. There’s a note in the recipe stating that if the formed loaves were refrigerated before being baked, the crust would be more blistered. I would have liked that, so I’ll plan for it next time. There will definitely be a next time. I timed it so the bread came out of the oven and cooled just before dinner. 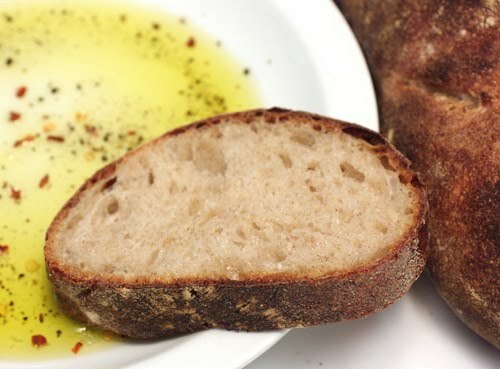 As dinner was being prepped, we cut into a loaf and dipped a few slices into seasoned olive oil. Then, we cut a few more slices. 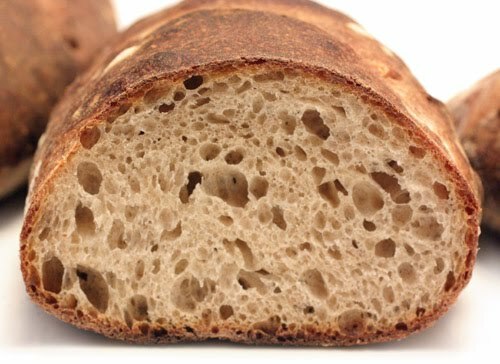 This delicious bread could easily become our favorite too. I’ve already almost forgotten that other experience, but I won’t rule out the possibility of one day layering some cooked garlic and balsamic syrup into this sourdough recipe. Have you seen the book My Favorite Ingredients ? I saw it mentioned a few times here and there, and then when I finally had a look at a copy of it, I had to bring it home. The book is by Skye Gyngell, and she is the head chef at London’s Petersham Nurseries Cafe. She describes her cooking as produce driven in that she takes inspiration from what is at its freshest and what flavors would complement that ingredient best. Her intention is to not interfere with the ingredients too much, to let them taste of themselves. That results in recipes that are very doable and very delicious when made with produce at the peak of its season. Each chapter in the book focuses on one ingredient, and it is shown in several different types of dishes. In the asparagus chapter, there’s a beautiful dish involving a tomato dressing and creme fraiche, one simply prepared with ginger and garlic, and a gratin of white asparagus. I’m really looking forward to cherry season, because the chapter about cherries has a cherry cordial and brandied cherries I want to try. There are chapters for tomatoes, nuts, fish and shellfish, vinegar, apples, cheese, and more. I currently have six pages marked, and those are just the recipes with ingredients that are in season right now. The dish you see here today is from the garlic chapter, and I had locally-grown garlic to use from my CSA. It was minced and then mixed with yogurt to make a tangy, flavorful sauce for a spicy, fried egg. First, the yogurt was mixed with the minced garlic and salt and pepper, and that was left to sit so the flavors could mingle a bit. Next, butter was browned with a few sage leaves in it, and I used leaves from my new sage plants in my garden. When I read this recipe with browned butter with sage and garlic yogurt, I knew this was going to be good. The browned butter was used to fry the eggs, I used some beauties from a local farm, and sliced red chiles were added as well. 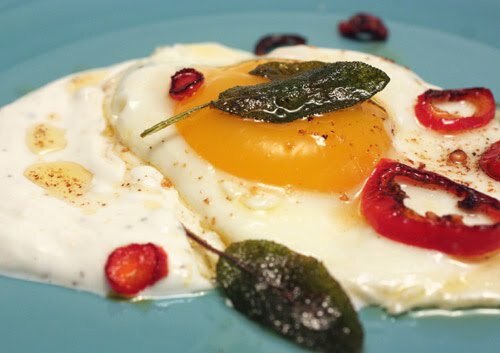 To serve, a dollop of garlic yogurt was placed on the plate, the egg and some chile slices were added, and that was topped with the sage leaves and a little drizzle of brown butter. This couldn’t have been simpler, and the flavors couldn’t have been more right. 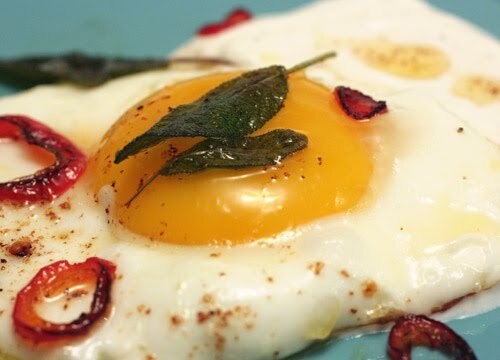 Rich, nutty, brown butter with earthy, herby sage and cool, savory, garlicky yogurt all to accompany a nicely fried egg with a hint of chile heat was, well, a pretty good breakfast to say the least. I’ll probably be mentioning this book a lot, and since I’m eyeing the crab cakes with corn puree and chili oil as I type this, that just might appear next. Tara Austen Weaver, What Are You Reading? Tara Austen Weaver’s recently published book The Butcher and the Vegetarian grabbed my attention because I too have meat issues. My issues are more of the picky-eater sort, but I was still intrigued by her journey into meat land after living as a vegetarian for her entire life. The book is full of great information about responsible, sustainable farming, ranching, and meat production, in addition to entertaining stories about what she was cooking and eating throughout this adventure. Tara has also been published in several anthologies, written for Edible San Francisco and other print publications, and her blog, Tea and Cookies, was selected as one of the top 50 food blogs in the world by the Times of London. I asked Tara, what are you reading? I just finished reading Kim Severson’s new memoir, Spoon Fed: How Eight Cooks Saved My Life , which I loved. She profiles a series of women whose work in food has inspired her, but it is Kim’s own story of finding her way back from alcoholism that is perhaps most inspiring. On the cookbook front, I am mesmerized by David Lebovitz’s gorgeous new book Ready for Dessert . The recipes and photos are so enticing I can hardly stand it. Other current inspirations are Andrea Nguyen’s Asian Dumplings (dumpling party, anyone? ), Monica Bhide’s Modern Spice (I’m fixated on Indian food lately), and Lorna Yee’s just released The Newlywed Kitchen (Lorna’s an amazing cook). The book on my bedside table is Auberge of the Flowering Hearth , by Roy Andreis de Groot. It’s the story and recipes of a small inn high in the French Alps. The book had been highly recommended but I’m finding it slow (Twitter has ruined my attention span, I’m afraid). It’s lovely and lyrical, but old fashioned (published in 1973). I pick it up from time to time and read a bit. It’s like a very rich dessert. Gaia's Garden (dreadful hippie name), by Toby Hemenway. It’s a book on Permaculture, which is a more sustainable way of living and growing food. It’s incredibly inspiring. Thank you for participating, Tara! Check back to see who answers the question next time and what other books are recommended.